14k gold-plated brass locket is approximately .5" across. The gold-filled chain is available in 16", 18", 20" lengths, perfect for layering with other necklaces. Model is wearing 18" length, with a different charm combination (an anchor with a mermaid). The tiny round locket hangs with an oxidized brass butterfly charm from the same ring. 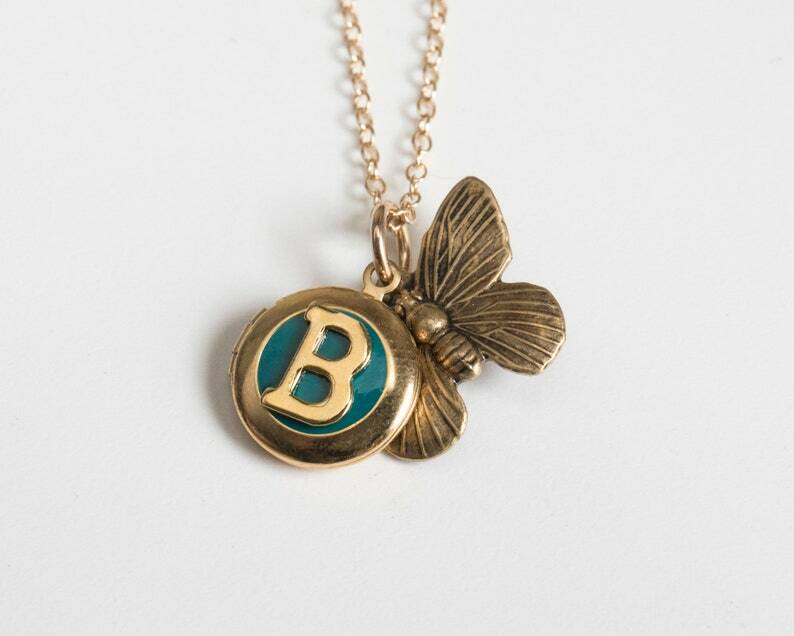 In the front, a golden B is set in teal blue resin. Lobster clasp. Inside there is room for 2 photos of your choice. Keep your necklace dry, and it will maintain it's finish for a long time. Gold-filled chain lasts many years, and the brass locket is plated with a full micron of gold. The brass charm can be polished up with a jewelry cloth or a light abrasive. Would you like a different letter than B? Simply select your letter in the option drop-down, then check out as usual. Other charms are also available! Mix and match to get your perfect initial necklace combo. A sweet gift for a mom whose child's name begins with an B.